The 2018 DeMarini Voodoo -10 USA is one of the most highly anticipated bats for use in junior play this season, and it’s a beaut. It’s not just because it’s a USA Baseball Approved bat, and thus useful for Little League play and other leagues as well. That just reassures you that it’s legal to use. No, what the 2018 DeMarini Voodoo -10 USA baseball bat offers is a bat that’s excellent to use. Let’s take a look at this bat, and at the 2018 DeMarini Voodoo WTDXUD2 in particular. It’s back, and in many ways it’s much better than it ever was before. Let’s start with the basics. This is a 2-piece hybrid baseball bat, with a barrel diameter of 2 5/8 inches. It looks quite effective and “cool”, with striking designs and colors. This comes with a -10 drop weight ratio, with sizes ranging from 28 inches in length (18 ounce in weight) to 32 inches (22 ounces). Perhaps the most important feature here for many junior players is that this comes with the new USA Baseball (USABat) certified stamp. Little League umpire are required to check the bats of hitters to see if they’re eligible for play, and with the clear stamp on the bat there can be no dispute that this is indeed legal to use. How Does This 2018 Voodoo Drop 10 Bat Handle? This is also a bat with a balanced swing weight. That means it’s very easy to control so your bat goes where you want it to go on your swing. At the same time, it’s also the lightest swing bat that DeMarini offers in its arsenal, so essentially you have the DeMarini bat that easiest to swing very quickly. This uses the venerable X14 alloy. It’s not really new, but that’s a good thing. It means you know what to expect from it, and its performance has always been excellent. You’re not gambling with this alloy. This material allows the DeMarini bat makers to put in an enhanced variable wall thickness throughout the length of the barrel. What you get is a huge sweet spot, and the ball will seem to explore right off the bat upon contact with the barrel. The bat’s bat weight control and performance is also improved by the terrific “3Fusion” end cap. It enhances the feel throughout the barrel, and for bonus points it even gives you an impressive sound when you hit. This 2018 DeMarini Voodoo -10 USA bat also comes with the 3Fusion handle. This design improves the weight control you have over the bat and it also gives you a better feel. Then right at the bottom of the bat you have the RCK knob. It feels like it’s been specifically designed to fit with your bottom hand just right. This enables you to bat with the utmost comfort, and that gives you the confidence you’ll need when you’re at the plate staring at the pitcher. The 3Fusion end cap works with the X14 alloy material to make this bat quite durable, while it’s also resiliently strong. It comes with a full 12-month manufacturer’s warranty, so you can use this for an entire season without worrying whether you’ll have to buy another bat to finish the season. Perhaps the most important feature that this has is that it comes with the new USABat certification, with the stamp clearly on the bat. This stamp assures umpires that it’s legal to use for Little League play. It also passes the new bat standards used for AABC, Babe Ruth, Cal Ripken, Dixie Youth, Little League, and Pony leagues. Now you don’t need a long discussion with the umpire about whether you can use this. Just show the stamp and you’re good to go. What will strike you most about this bat is that it gives you the utmost control over it. The balanced swing weight and other design features allow you to put this bat precisely in the spot you want through the strike zone. There’s not going to be an “oops” moment when you somehow lose control over the bat even for just a little bit. The level of control you have over it is amazing. It can feel like it’s part of your arm or something. It also offers another benefit: you can swing the 2018 DeMarini Voodoo drop 10 with amazing speed. You know what that does when you make contact. It means the ball is going to fly right back out in a hurry. This should translate to more hits and make you a more effective hitter at the plate. With the combination of control and fast wing speed, you can with practice make the baseball go where you want it to go when you swing. It really helps that the handle feels extremely comfortable when you grasp the bat with both hands. When it feels just right when you hold the bat, your grip won’t distract you. You can better concentrate on trying to hit the pitch just right. All in all you gain the confidence you need when you have this bat when it’s your turn to hit. You know you can control it even when you let loose and swing hard. You know that it’s comfortable in your hands. Does This Bat Have a Large Sweet Spot? It also has a massive sweet spot, so you have room for error concerning where the ball comes into contact with the barrel. A large sweet spot makes it more like that every contact with the ball can impart lots of energy on the ball. At the same time, the large sweet spot also reduces the chances of having vibrations travelling through the barrel to sting your hands. You even know that it’s a very tough bat, and it can last for the whole season. Its 1-piece construction can withstand numerous hits. It even helps that its appearance makes it look like a very competent bat to wield. For parents, all these benefits come with an extremely reasonable price tag, so it’s not as if you’re buying your kid a luxury item. It’s a bat that players will want, without eliciting complaints about excessive prices from parents. The 2018 DeMarini Voodoo -10 USA bat has a 2-piece construction design, which is usually made for contact hitters. Most bats for contact hitters have a 2-piece design. At the same time, this DeMarini bat has a balanced swing weight, and that’s what contact hitters usually prefer. Power hitters tend to go with an end-loaded bat. What this may mean is that this can be used by power hitters who may prefer a bit more control over their bats. Since it’s a 2-piece bat, you may have problems if you’re a power hitter. The design gives the resulting vibrations an unimpeded highway through the length of the bat, and this can sting your hands. It looks great, and more importantly the bat sports the crucial USABat stamp that makes it eligible for use in your league. There won’t be any debate about its eligibility. That should keep you from worrying about whether it’s legal or not. But what’s more, it’s an excellent bat given its price range. It offers a huge sweet spot, enhanced control, and a very quick swing speed. 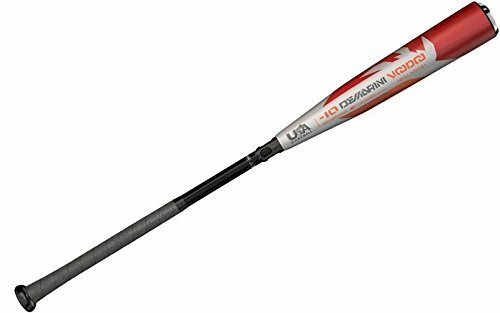 For many junior baseball players, the 2018 DeMarini Voodoo -10 USA is a keeper.